Account locks normally are not a big deal to troubleshoot. Often times it is a user typing in an incorrect password to the account they are trying to logon to too many times. 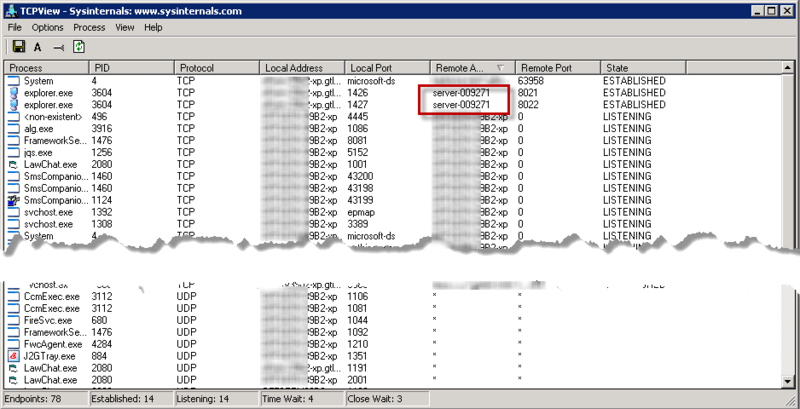 Other times, it is being caused by expired or incorrect cached credentials being used to authenticate to some network resource. In the latter case, this is a simple matter of going onto the workstation that has been identified as one locking the account and removing the cached credentials. 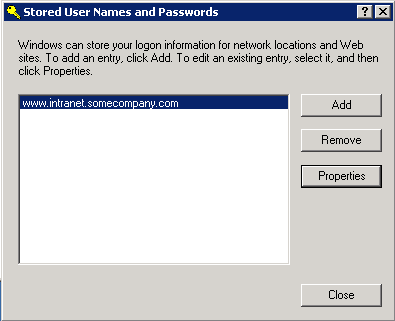 In Windows XP, this can be done by going to Start > Settings > Control Panel > User Accounts > Advanced (or Manage Passwords for non-admins) > Advanced > Manage Passwords. Alternatively, you can just use the control userpasswords2 command. In this case, though, it wasn’t that simple. The account that was getting locked was a shared domain account that was used to logon to multiple workstations throughout the day. As a result, we were seeing this account getting locked from these various workstations. The account was specifically used by contract employees within the company in a remote office and I began to suspect that someone was inputting the incorrect password. I was reassured that that wasn’t the case but I needed to verify anyway. 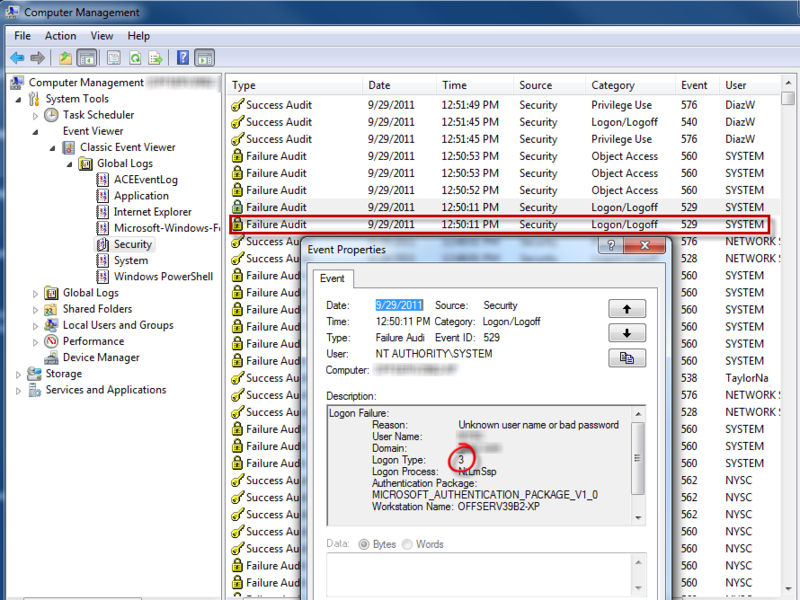 You can determine account logon types by reviewing the Security logs in the Windows Event Viewer of the system that locked the account. I reviewed all the workstations by looking at the last account lock in the Account Lockout Status Tools and comparing that with the workstation security log. Type 2 – Interactive. This is akin to sitting at the workstation/terminal and typing in the credentials. Type 3 – Network. You see this most often when connecting to shared folders, printers, or other network resources. Type 4 – Batch. Usually scheduled tasks. Type 5 – Service. Services can run in the context of any user account. Type 7 – Unlock. You see this when a system is unlocked. Type 8 – Network Clear Text. I don’t think you will see this too often (or ever these days). When passwords are sent across the network in clear text, you will see this. Type 9 – New Credentials. You will see this when you use the RunAs command with the /netonly switch. Otherwise, it is recorded as a type 2 event. Type 10 – Remote Interactive. Remote desktop, remote assistance, terminal services. Type 11 – Cached Interactive. Cached logons, i.e. mobile/laptop users not connected to the network. I began to assume that print jobs to this specific printer were causing the domain account to become locked. 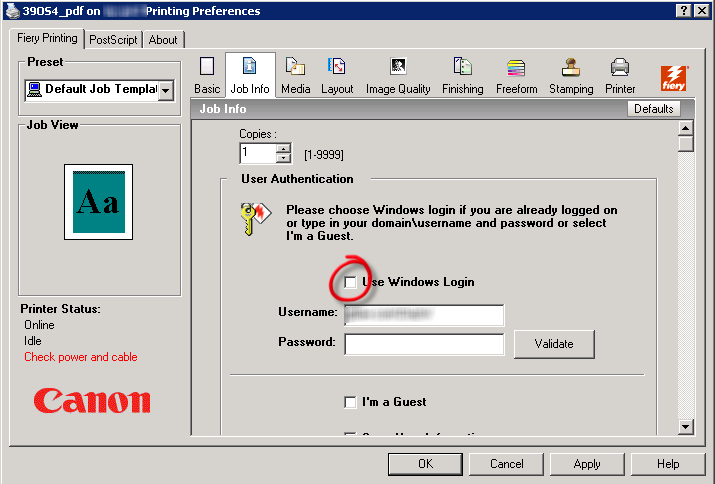 To test this assumption, I printed a test page to this printer and notice two failed logon attempts. After 3 print jobs, 6 bad password attempts have failed. Our accounts lock after 5 failed attempts. No other printers the workstation/account is connected to exhibit this issue. To further isolate this as either an account issue or a printer issue, I connect to the printer from my own workstation and sent a test page, with the same two bad password attempts recorded in the Account Lockout Status utility. 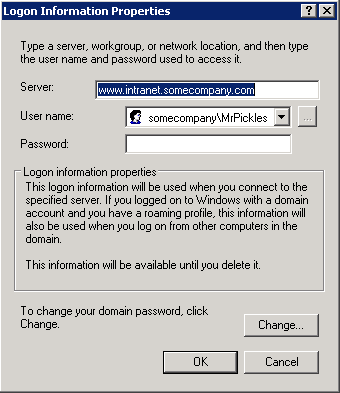 Checking the option Use Windows Login resolved the issue with the bad passwords being sent from the domain account. Finally, if you are unable to determine the cause of the account lockouts, within the Account Lockout and Management Tools there is a zip file called AlockoutXP that contains a dll and registry file. Drop the dll in the system32 folder of the workstation that is locking the account, run the reg file and reboot. When the account becomes locked again, go to c:\windows\debug and examine the alockout.log. 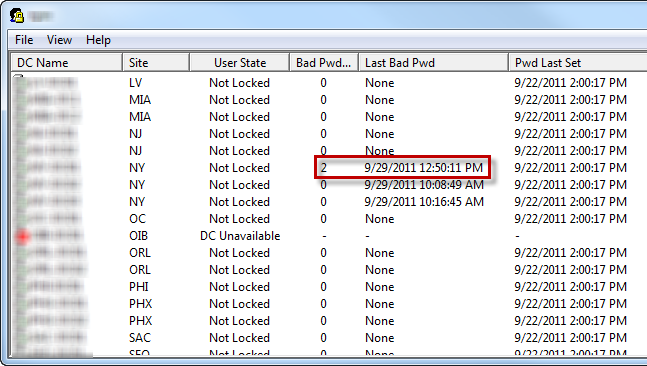 Compare lockout times with the output in the log. Ideally, if some service or program on the workstation is the culprit, you should be able to determine if some particular service or program module is being loaded when the account locks and indirectly establish what it is part of. This entry was posted on November 1, 2011 at 11:34 am	and is filed under Troubleshooting. Tagged: Networking, Printing, TCPView. You can follow any responses to this entry through the RSS 2.0 feed. You can leave a response, or trackback from your own site.